Julie and Chet are baristas in a busy coffee shop. They each pursue their respective love interests while trading banter with each other and their customers, who see nothing odd in the fact that Chet is a centaur and Julie is a werewolf who changes into her wolf form when she gets upset. Julie is on the cusp of a new relationship when she receives a warning from a witch who has a vision that something bad is looming in her future. 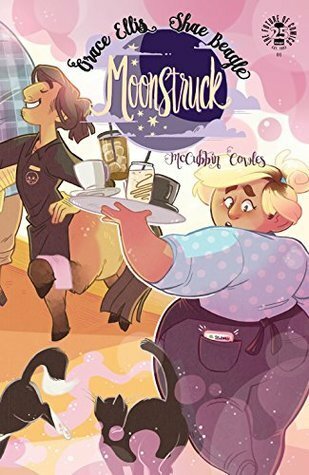 Moonstruck is a new ongoing series written by Grace Ellis, creator of Lumberjanes and illustrated by Kate Leth (Patsy Walker, Fraggle Rock and Edward Scissorhands) and newcomer Shae Beagle. The art is reminiscent of Lumberjanes, featuring characters with a variety of different body types and lots of strangely cute magical creatures. Also, like Lumberjanes, it has gay and lesbian characters, where their sexuality is not the focus of the story. Not a whole lot has actually happened in the plot so far, but it's an interesting set up for things to come. Chet and Julie's friendship is believable and I'll be interested to see what becomes of them. One tiny nitpick I have is that, while it is a fantasy story and I know this is unreasonable, it bothered me that Chet was handling coffee mugs with his hooves in the cafe. That cannot be sanitary. Moonstruck is a fun comic featuring centaurs, romance and bad puns. Issue #1 is a promising start to the series.